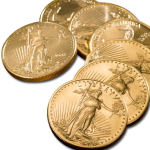 Los Angeles – The price of Gold ended the year at $1,421.20 an ounce after gaining 1.25 percent on Friday. The price of silver was up 1.60 percent on Friday to close the year at $30.88 an ounce, close to its highest level since 1980. Silver posted a record 83 percent gain for 2010, its strongest performance in 27 years. The Gold/Silver ratio (GSR), the number of ounces of silver that can be bought with an ounce of gold ended the year at 46. The week began with China's central bank raising lending and deposit rates on Christmas Day for the second time in a little over two months as it stepped up its battle against rising inflation. China raised its benchmark one year lending rate by 25 basis points to 5.81 percent, and the one year deposit rate was increased by 25 basis points to 2.75 percent. China's actions highlight concerns that efforts to reel-in inflation will also slow global growth. Investors were very surprised when the price of gold didn't fall by double digits after China announced its interest rate hike. Markets had been dreading China's decision to raise rates for a while so many analysts believe the news was already priced in. Premier Wen Jiabao and Chinese officials may decide on further rate hikes and bank reserve requirements going forward in 2011, according to a report by JPMorgan. The People’s Bank of China (PBOC) is also considering selling bills in an effort to drain liquidity from the Chinese financial system, allowing the Yuan to rise further against the U.S. dollar. The Yuan ended 2010 very strong, pushing past 6.59 per dollar on Friday and closing up 3.6 percent while raising investors hopes of even more gains to follow in 2011. According to a Bloomberg survey of more than 100 investors, traders, and analysts, silver will be the top performing commodity in 2011, with gold a close second. The survey of 15 commodities found that silver is expected to reach $40 an ounce in 2011, for a gain of 37 percent, while gold was forecast to rise by 23 percent, taking the gold price to $1,700 an ounce in the New Year.